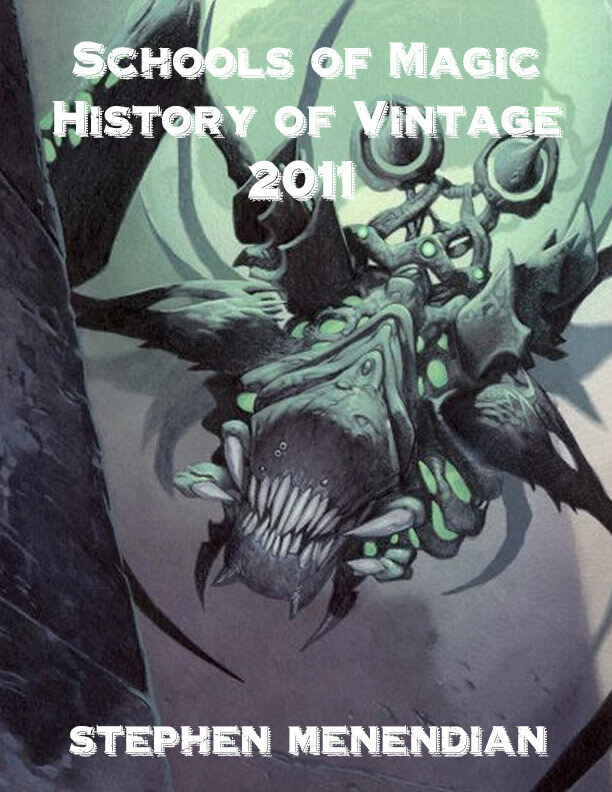 2011 may be one of the most tumultuous years in the history of the Vintage format that does not feature a restriction. It was a textbook example of how new decks are birthed by innovation as creative answers to metagame problems. Turbo Tezzeret and the Vintage Control decks broke open Lodestone’s stranglehold on the format. Slash Panther was a new solution to the menace of Jace. Gush surged in the third quarter, but fell back to earth by the end of the year, finishing Q4 with just 15% of Top 8s. Dredge took home the most coveted title in the format, motivated, in part, to challenge a dismissive claim that columnist Brian DeMars made. In the process, Mark Hornung made history in defeating one of the most stacked Vintage Championship Top 8s of all time. The community benefited tremendously from new modes of communication and expression, including the streaming and video capture at GenCon, the Waterbury, and the Spanish “Eternal Weekend,” and podcasts like “So Many Insane Plays.” Players could now watch Vintage tournaments in real-time, and not simply follow updates shared by cell through community maintained message boards, and listen to strategy content at home or on the go. Times and technology were changing, with much more to come. Learn all about (or relive) this invigorating time in the History of Vintage. Given the state of the format, Vintage players braced themselves when the second expansion in Scars of Mirrodin block, and 54th Magic expansion set, Mirrodin Besieged, was released February 4th. With artifacts nearly a third of the set, Mirrodin Besieged threatened to entrench Workshop’s position further with new tools and technology to fortify its position and preempt any attempt to take the fight to it. Although not offering as many fringe or peripheral playables for the O’Brien School decks as feared, the set introduced a staple playable that could be used by both more aggressive and more controlling Workshop decks, and would join a list of core lock parts that would see play for years to come. Billed as “a Pithing Needle on legs,” the truth is that Phyrexian Revoker was much better. Although Revoker could not be used to stop Wasteland or Bazaar of Baghdad activations, it could be used as a quasi-Null Rod effect to shut off Moxen, tightening the grip of the asphyxiation strategy. One of the best answers to a Sphere of Resistance or Thorn of Amethyst is to play a land and a Mox. Revoker was the most natural response to this sequence, further tightening the noose. In addition, Revoker was a card that could be used to shut off Jace or Tezzeret, and was good enough to play main deck. Despite providing Workshop players with yet another high-level lock part, on balance, Mirrodin Besieged surprised by providing Workshop competitors even more playables. In my set review I was most enthusiastic about Leonin Relic-Warder, which I believed was a “shot in the arm” for Fish and Beats decks as a utility creature that could combat Workshops, Oath, and Time Vault simultaneously. But the cards I concluded would see the most play “by the time of my next set review” were “Steel Sabotage, Myr [Phyrexian] Revoker, and Blightsteel Colossus.” In his set review, Brian DeMars described Blightsteel Colossus as a “Vintage Game Changer” on account of its ability to win the game with a “single combat step” among Tinker targets. This “one-shot” Tinker target was met with incredulity in the Vintage community. One poster called the spoiled card a “fake? Please? This is completely silly,” while another wrote that it was “unbelievably busted.” Once confirmed by the official spoiler, shock and disbelief turned in to disappointment that Wizards would allow such a powerful finisher to see print. This commentary widened in to online debate over power creep, flavor, and “good design,” but it was mostly academic, as Vintage players now had to contend with the new reality.